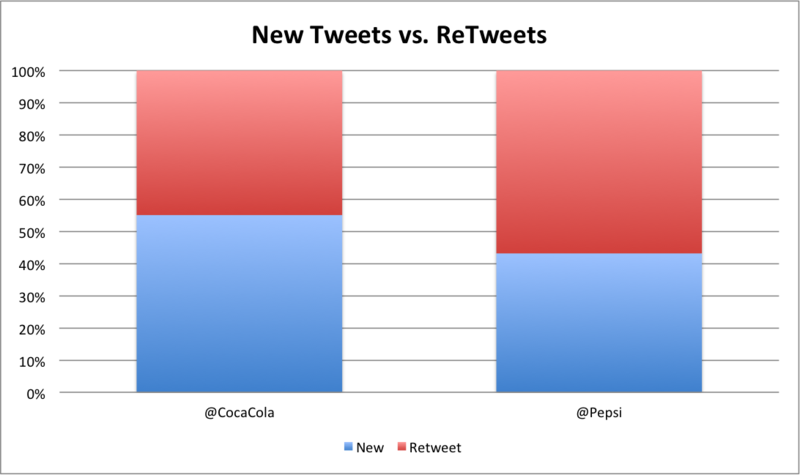 Tweetdown: Coke Vs. Pepsi — Coke is It! And we can see that Coca Cola gets about 75% more references than Pepsi does. An analysis of the gender of the senders shows that both brands are about evenly split between males and females (and that about 50% of the people tweeting are of unknown gender). it is very unusual to see a large selection of tweets have virtually no tweets with a negative sentiment! 236 RT @CocaCola: Sometimes a high five is so good you need to high five again to celebrate it! 71 RT @pepsi: When life gives you lemons, ask for a gift receipt and get a Pepsi. 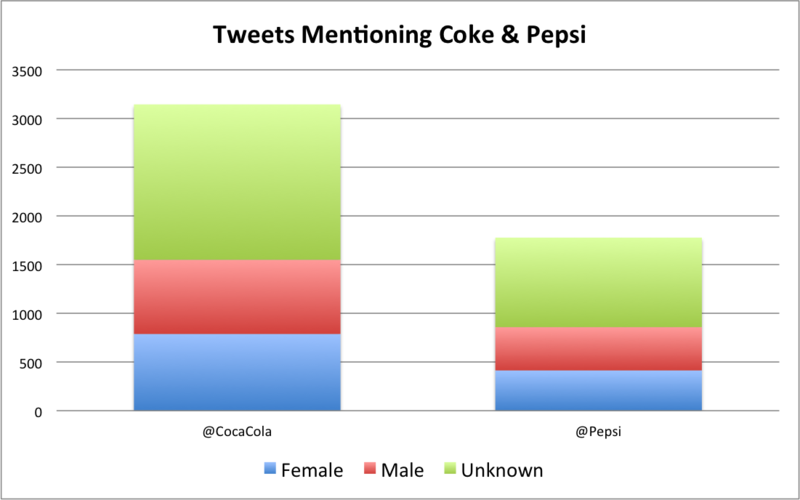 I think it’s interesting that Coke’s retweets are coke centric, while Pepsi’s tend to mention celebrities. Clearly a reflection of their marketing efforts. It’s also interesting that, for Pepsi, virtually the only thing being retweeted are @Pepsi tweets (16 out of the top 20 retweets are from @Pepsi), while for Coke there is a broader mixture of sources (8 out of the top 20). That generally indicates a more vibrant community for Coke. Still, when I look at the activity for both brands, there is nonetheless a relatively low level of engagement with the overall Twitter community. When you look at the engagement that TV personalities get, for example, it is way beyond what these two venerable brands get. This shows an area which each can gain much more value from Twitter; the value of getting higher levels of engagement is immense. If you read Robert B. Cialdini’s “Influence: The Psychology of Persuasion“, he talks about how taking small steps to demonstrate commitment can lead people to a deeper commitment. In the case of Twitter, getting more people to tweet on Coke or Pepsi will result in not only those people forming a deeper attachment to the brands, but serve as “social proof” for others as well. It’s all well and good for the brands to tweet out, but it is those tweets back that drive real engagement. 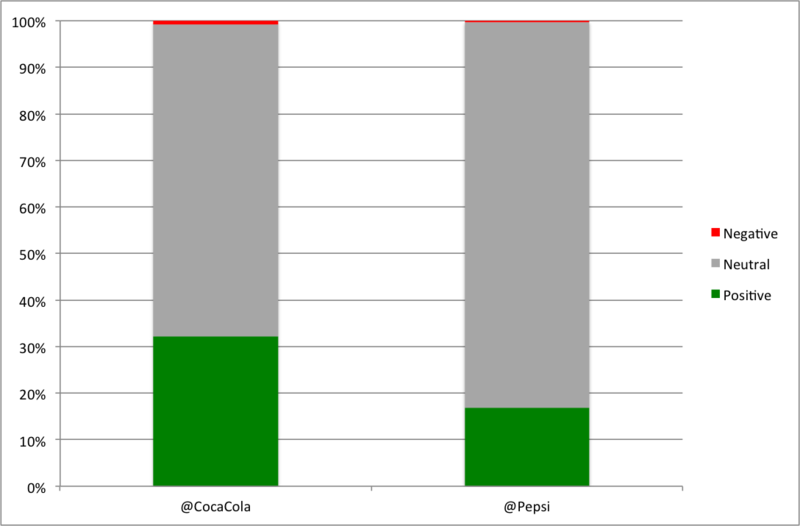 All tweets mentioning @cocacola or @pepsi for a 1 week period ending roughly at 1pm on 3/31/2012 were collected and analyzed. Gender was assigned using a mechanical process that looks at first names and terms used in the description. Sentiment was scored mechanically by looking at the choice of words and phrases in the tweets. Note that it’s very hard to gauge the sentiment of tweets, and so the large neutral ratings for each brand should only be interpreted as the inherent weakness in mechanical sentiment scoring.